The rules of flat track roller derby get a complete (and overdue) teardown and rebuild for the new year. 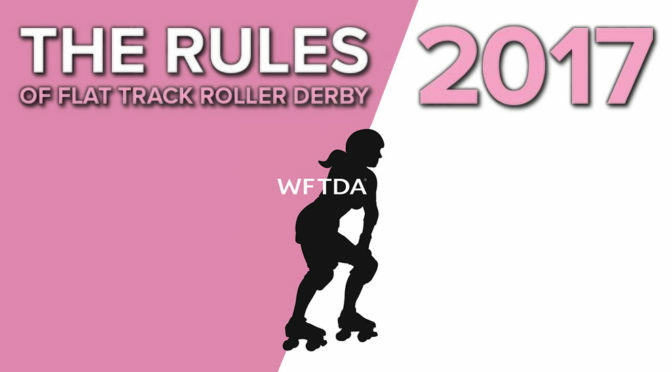 Two years following the previous update—and an extra 24 hour delay for good measure—the WFTDA has released the updated 2017 version of its roller derby rule book. Officially, it’s the February 15, 2017 revision, the date it will go into effect for WFTDA and MRDA sanctioned play. With its ninth iteration, the WFTDA has completely transformed the most common rule set in roller derby. The outgoing 2015 rulebook, a single PDF file with its 27,000 words crammed into 70+ pages, has been blown to smithereens. Its replacement is a series of smaller, more targeted documents designed to try to be easier for players to digest, referees to interpret, and for the WFTDA to update when necessary. The mainline WFTDA Rules of Flat Track Roller Derby has been boiled down to a more simple description of the game. The familiar sections of the book now offers a plain-English summary of the critical dos and don’ts for gameplay. The Casebook, a new doc that accompanies the main rules, contains guidance and specific examples for each rule. The Casebook entries, formatted similarly to the 2015 rules, are meant to convey how rules should be interpreted through direct examples rather than through the endless dozens of individual rules that left the old rulebook open to differing views on how things should be called. Many other former rules pertaining to officiating, safety, and WFTDA sanctioning guidelines have been removed from the rulebooks altogether, owing to them not strictly being necessary for general gameplay. They are being moved to other areas, such as the WFTDA Sanctioning Policy or within WFTDA officiating documentation. However, these additional documents are not yet ready for release. The official PDF version of the 2017 rules is also currently unavailable. The WFTDA has targeted a release date of February 1, 2017 for the rest of the update, including translations, to be published. For now, the main rulebook and Casebook are only available to view online at the new WFTDA Rules website, rules.wftda.com. The rules site was designed to be much more friendly towards mobile devices, and in fact act as a replacement for the now-discontinued WFTDA rules app for iOS and Android. Beyond the new rules format, gameplay has also received some tweaks and improvements. Skaters have also voted to eliminate the point of no return line for the penalty box, allowing entry from any direction. Penalized players can now skate in the clockwise direction in the outer referee/safety lanes to get to the penalty box, much like they can when exiting it. It’s a change that is already causing some controversy, with worries that it will increase the chances of at-speed collisions between clockwise skaters and counter-clockwise referees not fully aware of one another. Several rules have been enacted that will help prevent extended periods of gameplay with fewer than two jammers on the track. Besides the cutting yields, which jammers will benefit from the most, opposing jammers that hit the penalty box simultaneously will now be released immediately, eliminating the awkward 10-second no-jammer penalty runoff. The dreaded “2-minute power jam” is also going away, allowing a team that forgets to field a jammer the chance to do so at the cost of a Delay of Game (blocker) penalty to the team captain. There are many other changes pertaining to gameplay and the structure of a WFTDA-rules roller derby bout for the coming season. The WFTDA summaries for both are linked to in the previous sentence, which you should check out. The news release about the 2017 update has a lot more on how things are changing and where you find updated information on everything; that’s here. Though the WFTDA has only just released the rules, we here at Roller Derby Notes have been privy to the new rules format and some of the gameplay changes for several months now. This extra marination has given us a good grasp of the rules concepts, which we will apply towards our forthcoming 2017 WFTDA rules analysis, a critical examination of all the important changes. Look for that sometime in the early new year.